The Hong Kong Research Institute of Textiles and Apparel (HKRITA) has once again scooped a plethora of medals from the 47th International Exhibition of Inventions – with this year's winners including a mini in-store production line that recycles post-consumer garments into clean, wearable clothes. HKRITA has participated in the International Exhibition of Inventions of Geneva for the past ten years, winning a total 45 awards – of which 21 are gold medals. This year it came away with three gold medals, one silver medal and two bronze medals for its six entries. In addition, its 'Highly Efficient Far Infrared (FIR) Functional Textile' project received a special prize from the National Research Council of Thailand. "Once again, we are honoured to receive this international recognition for our breakthrough research and innovations," says Edwin Keh, chief executive officer of HKRITA. "Our award-winning entries this year are under the theme of sustainable development with a particular focus on environmental protection, which aligns with our vision and mission in driving concerted and focused R&D efforts to enhance the competitiveness of our local industry and benefit society as a whole. "It's our goal to collaborate with local academia and the industry, supporting continual technological advancements while facilitating re-industrialisation and sustainable development." Conventional production of FIR fibre involves expensive chemical treatment to achieve heat preservation, which degrades the yarn properties and quality. HKRITA's special award-winning project, however, defines the cross-sectional profile of fibre and modifies its parameters ideally for fibre spinning, improving brightness, finesse, linear shape and drawing method to achieve optimal performance from a highly efficient and top-quality FIR fibre. Compared to the conventional method, HKRITA claims this is "more cost-competitive and eco-friendly." The solution provides permanent far infrared function for heat preservation and well-being benefits, such as keeping the wearer's body warm, improving metabolism and sleep quality, facilitating fatigue recovery, and increasing blood oxygen and circulation. Garment-to-garment (G2G) System – A Mini Mill in Retail Space: This is a mini production line in a retail shop that recycles post-consumer garments into clean, wearable clothes. The complete process takes place in a 40ft glass walled container. Its anti-vibration, noise- and dust-controlled design minimises disturbance to nearby businesses and can be operated within community areas like shopping malls. Visitors can look inside to view the components running the system, even deepening their experience by recycling their own used clothes. 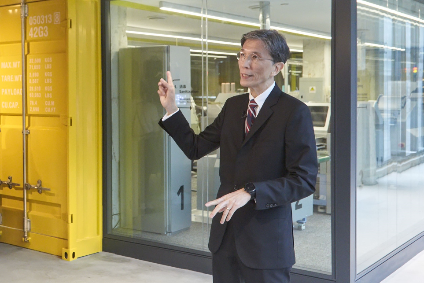 Located at The Mills, a revitalised art and cultural complex located in three redeveloped former Nan Fung cotton mills in Hong Kong, the Garment-to-Garment recycle system (G2G) opened in September last year. The production line was recently awarded the Red Dot Award: Product Design 2019, in recognition of its high design quality, selected from more than 5,500 products from 55 countries. Eco-friendly Cellulosic Superabsorbent Polymer: This transforms cellulose powder recycled from used cotton polyester blends into superabsorbent polymer (SAP) which can absorb more than 30 times the volume of liquid and retain more than 20 times the volume of liquid relative to its own mass. With great water retaining and moisture releasing properties, the cellulosic SAP is an ideal agricultural water retention agent, helping agricultural products adapt to extreme climate conditions, such as drought and over-rain. The cellulosic SAP is made from textile wastes and its water release and retention function can be reused on both sunny and rainy days. A Novel Method for Decolourisation of PET from Post-Consumer Textiles: Sustainable PET textile decolourisation uses dye adsorbent materials, activated carbon (AC) particles or crosslinked polystyrene (PS) beads in a hydrothermal environment to remove dispersed dyes effectively from PET textiles. It is a physical process that involves no chemical reaction. Another benefit is the low cost of the dye adsorbents relative to current decolouring chemical agents. With an average 94% reduction of colour intensity, the approach is effective in decolouring fibre, yarn, fabric or garment PET textiles which can be re-dyed and reused to make new garments. The purified water can be reused in the hydrothermal treatment. Non-aqueous Solvent Medium (NASM) Dyeing for Textiles: This process uses supercritical carbon dioxide (Sc-CO2) to replace water as the solvent medium for dissolving the dyestuff into the substrate to dye synthetic, natural and blended materials. Sc-CO2demonstrate slow viscosity, high diffusivity and excellent solubility with very low surface tension. Many dyestuffs used in industry are soluble in Sc-CO2, making it suitable for textile dyeing. Dyeing time ranges from 60 to 240 minutes compared to 180 to 240 minutes for water dyeing. No extra auxiliaries are required in the dyeing process, and up to 90% of the NASM used in the process can be reused. NASM is a waterless process, so wastewater treatment facilities are not required and overall operating cost can be reduced by 5% or more. Silk Single Yarns Spun on Cotton Spinning Frame: Conventional spun silk production is labour-intensive, involving tedious procedures including a gassing step. Gassing results in high energy consumption and loss of raw materials, and adversely affects working conditions. This new spinning method produces 100% spun silk single yarns on a cotton spinning system without the gassing process, and so reduces CO2 emissions. It also reduces energy consumption by 15% and production time by 20%, while increasing production efficiency by 20%. The factory work environment is greatly improved, and the spun silk yarns maintain good quality. The 47th International Exhibition of Inventions of Geneva took place from the 10-14 April. It is arranged under the patronage of the World Intellectual Property Organization (WIPO), the Swiss Government and the City of Geneva, and showcases innovations and inventions from around the globe.